We met the director of Lumière Technology, Jean Pénicaut a few months ago. The photographic process marketed by this company struck us as being absolutely revolutionary. 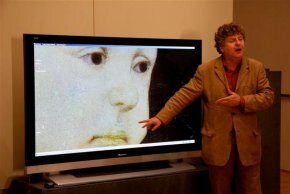 During the Journées Européennes du Patrimoine (European Heritage Days) last weekend, Alain Tapié, director of the Palais des Beaux-Arts de Lille invited him to demonstrate this multispectral digitizing system. 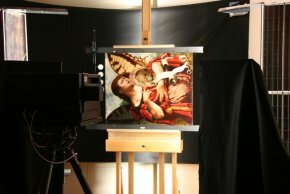 Seven paintings from the collection were photographed (ill. 1) with this process shown to the public for the first time in a French museum . During the two days of the Heritage Days, museum goers discovered the extraordinary possibilities which this technique offers for reproducing and studying paintings. In one photo session lasting barely an hour, a painting is photographed in 240 million pixel definition, by splitting the light spectre from ultra-violets to infra-reds. The results, which can be printed or viewed on a high-definition screen, is amazing. It provides specialists, conservators or restorers with a considerable number of basic information. from the Former Southern Low-Countries, XVIth C.
Let us remember that the color of a painting depends on the pigments and the light which falls on it. The technology used here provides a reproduction with the colors being exactly those of a painting under a certain light (ill. 2). Since the pigments used for photographs are different than those used by the artist, when the light changes, the colors may not correspond to those of the original. The goal, eventually, is to create a printer using pigments that react in the same way as old ones do, thus producing reproductions which are identical to the original no matter what the light. The results today are already exceptional. With this technology, Federico Zeri would never have preferred black and white. But these are not the only advantages. The 240 million pixel definition shows the slightest detail (ill. 3), some of which are invisible to the naked eye, not only in a natural color, but also under infra-reds, ultra-violets, false or inverted false colors, even when simulating a lighter varnish. 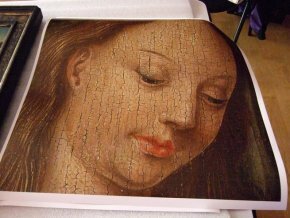 Without going into complicated technical explanations, this means that the same painting can be seen under different aspects allowing specialists to analyze in-depth the manner in which it is painted or to see what is hidden under the painted layers. Even better, the pigments used in the painting can be identified at any given spot on the canvas, without having to take a sample, thanks to the spectral information contained in the length of their light waves. 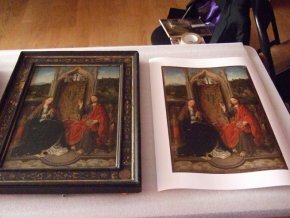 Lastly, the digitized photographs of the paintings, in identical light conditions, can be compared as if working with the originals themselves. The images become a perfectly exact measuring tool. The interest of this technique for an art historian is obvious, especially when the complete works of an artist are available in this way. Lumière Technology has already photographed several Van Goghs at the Musée Kroller Muller in Otterlo and will go to the Van Gogh Museum in Amsterdam in October. The latter would like to have mathematicians and physicists study the artist’s brush strokes (orientation, length, manner in which he ends his gesture…) This technology can help them to do so. Among some of the results on Van Gogh, we would like to point out a discovery on a canvas at the Kroller-Muller : some brush strokes which appear to be of the same green color are in fact executed with very different pigments. Let us imagine that this characteristic — unknown to copiers since the naked eye only sees identical colors — is found in other paintings, it would provide to specialists vital evidence of its authenticity. Progressively, large museums are realizing the radical innovation of the system invented by Pascal Cotte who founded Lumière Technology and all its possible applications. Recently, the team travelled to Cracow to photograph the Lady with an Ermine. Eventually, the company would like to create the largest possible database providing art historians with an incomparable work tool and museum goers a new source of knowledge. Former Southern Low-Countries, early XVIth C., Christ Blessing the Virgin, Oil on wood, State Deposit, 1946 / Inv. P 1726. Biagio d’Antonio, The Virgin in Adoration of the Child Jesus, Oil on wood, Inv. P 791. Hans Holbein the Younger (after), Portrait of the Painter’s Family, Oil on vellum marouflé on wood, Inv. P 191. Jan Sanders Van Hemessen, Vanity, Oil on wood, Inv. P 2009. Pierre Paul Rubens (after), Prometheus Chained, Oil on wood, Inv. P 115. François Boucher (attributed to), Allegory of Painting, Oil on canvas, P 342. Jacques-Louis David, The Fight between Minerva and Mars, Oil on canvas, P 1983. According to Florence Gombert, conservator at the Palais des Beaux-Arts for the Antiquities, Middle-Ages and Renaissance department, it is not impossible that this painting might be revealed as being in fact an authentic Holbein.